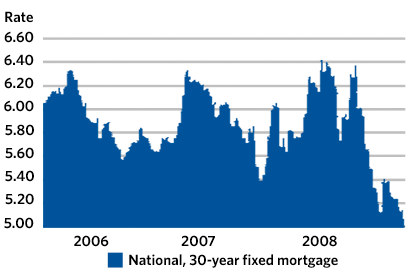 With few bright spots in today’s economy, the combination of a low interest rate cycle and the Federal Reserve’s decision last week to buy up to $1 trillion in assets has created a “perfect storm” of opportunity for qualified consumers hoping to either refinance their current mortgage or take advantage of the low prices on low priced or foreclosed properties. In fact, loan terms for 30 year fixed-rate mortgages fell to 4.63% from 4.89% for the week ending March 20, the Mortgage Bankers Association (MBA) reported Wednesday. That is a full percentage point lower than a year ago and the lowest rate in the history of the survey, which began in 1971. With interest rate levels so low, homeowners with $200,000 loans can pay approximately $225 less in monthly mortgage payments than they were in July of last year, when 30-year rates peaked at 6.63%. As a result of these lower rates, refinancing of current loans accounted for almost 80% of all mortgage applications last week, with application volume running almost 30% above one year ago levels. This activity could be a boon for banks as well, where mortgage fee income could spike. While it certainly won’t make up for credit losses or further write-downs, it can provide a small glimmer of hope in an otherwise difficult economy. There may be some challenges, however, with the volume of applications testing the operational capacity of banks where staff has been reduced and many loan servicers are assigned to loan delinquencies and workouts. The good news is that many of the people looking to refinance are already good loan customers. John Jaye,an analyst at consulting firm Aite Group, points out that if borrowers are refinancing then they were most likely current on their mortgage payments to begin with and are already qualified as borrowers. That means banks will have fewer worries that borrowers are likely to default at some point, he says. The households refinancing may also provide a great opportunity for cross-selling if they are new to the bank such as a new checking account for automatic payment withdrawals or a money market account with an auto save option. On the flip side,the refinancing activity does little to help those borrowers that are struggling to make their payments. Those borrowers are unlikely to take part of the boom, he says. The best opportunity for banks is to leverage the insight available on credit bureau files to find households in their market footprint that are paying interest rates that are 100 -200 basis points (1-2%) or more higher than today’s rates. Obviously, it is more beneficial for banks to suppress those addresses that represent current mortgage customers, but many banks would rather refinance a current customer and generate the fee income and goodwill than to have a competitor steal the business of a customer with a good payment history. By using the insight that is on credit bureau files,banks can select customers based on their payment history, current amount of payment, current inferred interest rate (actual rates are not on the file), and tenure of current loan. There is the opportunity to reduce monthly payments that can be achieved when a consumer decides to refinance their current mortgage at the current lower rate. A consumer could decide to keep their monthly payments the same, but reduce the term of their loan (moving from a 30 to a 15 year term). A consumer can move from a variable rate loan to a fixed rate alternative that locks in today’s favorable terms. Consumers can use today’s rates to take advantage of depressed prices on current and foreclosed properties. Harland Clarke Marketing Services has a tremendous amount of experience in marketing both traditional mortgage loans as well as home equity lines of credit. 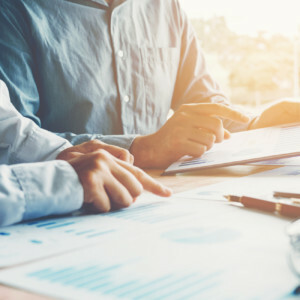 Members of our strategy team have worked in the real estate lending arena and developed programs for companies like Countrywide, National City, Fifth Third, and other leading lenders. This provides the historical foundation to provide banks superior advice and guidance in building a mortgage loan acquisition or refinance program or an equity credit acquisition or utilization process. So, why is it still so hard for financial institutions to court millennial home buyers? The answer may lie in the approach.